We hope to cover some of the more frequently asked questions from our customers here. If you have any other questions not covered here, please feel free to contact us. Q: Do you take debit or credit cards? A: Yes we do, but cash is preferred, because it’s much faster on a busy day. Q: What is Kickapoo Wild Adventures location? A: We are located less than a mile North of Ontario on Hwy 131. We have a huge sign out front so you won’t miss us. Q: Can we have glass bottles on the river? A: Absolutely not, we have a –No glass on the river– policy. We don’t want anyone getting cut on a piece of broken glass. A: Drinks, snacks, coolers, sun block, bug spray, zip lock bags, water proof cameras, and ice. Q: What should we wear? A: Dress for the weather. Swim suits in the warmer months. Wear old shoes that you can get wet. Q: What NOT to bring? A: No glass bottles. Anything that you don’t want to lose, such as cameras, keys, and cell phones. If you don’t need it on the river, leave it in your car. Q: Can we bring our pets? A: Your pets are welcome to come, but you the owner of the pet are responsible for them. Your dog will enjoy the Kickapoo just as much as you will. Q: Do you offer camping? A: We offer limited camping, meaning outside water, porta potties, and a fire pit. Camping is on a case by case basis. Q: Do you have trash cans and recycling? 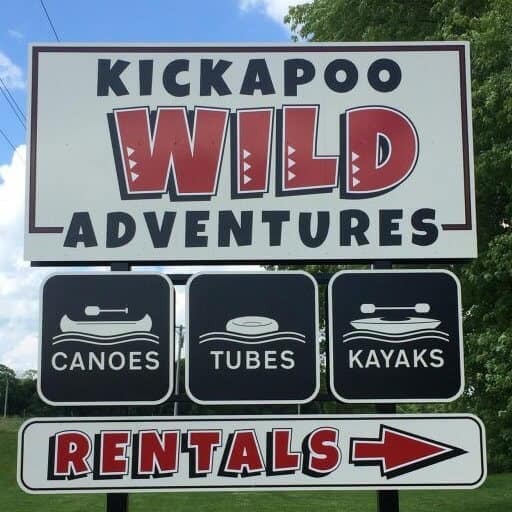 Yes we do, both on premises and at canoe landings.